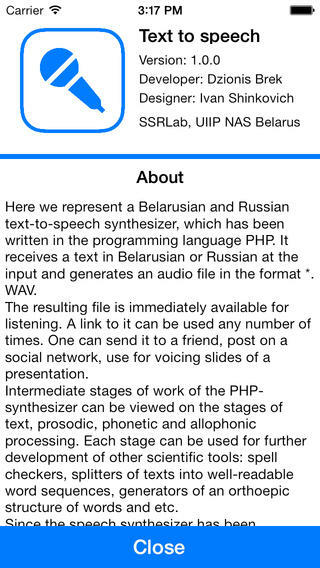 Here we represent a Belarusian and Russian text-to-speech synthesizer, which has been written in the programming language PHP. It receives a text in Belarusian or Russian at the input and generates an audio file in the format * WAV. The resulting file is immediately available for listening. A link to it can be used any number of times. One can send it to a friend, post on a social network, use for voicing slides of a presentation. Intermediate stages of the PHP-synthesizer work can be viewed as the stages of text, prosodic, phonetic and allophonic processing. Each stage can be used for further development of other scientific tools: spell checkers, splitters of texts into well-readable word sequences, generators of word orthoepic structure and etc. Since the speech synthesizer has been developed in PHP, it can be embedded into PHP-websites according to the agreement. The main scientific direction the of SSRL is the theory and applications of man-machine speech communication. Калі Вы знайшлі ў тэксце памылку правапісу, калі ласка, выдзеліце гэты тэкст і націсніце Ctrl+Enter.